On Saturday, September 26, 2015 hundreds of people gathered at Christ Church Cathedral in Louisville, Kentucky. Sponsored by the Sowers of Justice Network, a coalition of churches and individuals working for social justice through nonviolent action, this day (and organization) is a model that many of our communities can learn from. 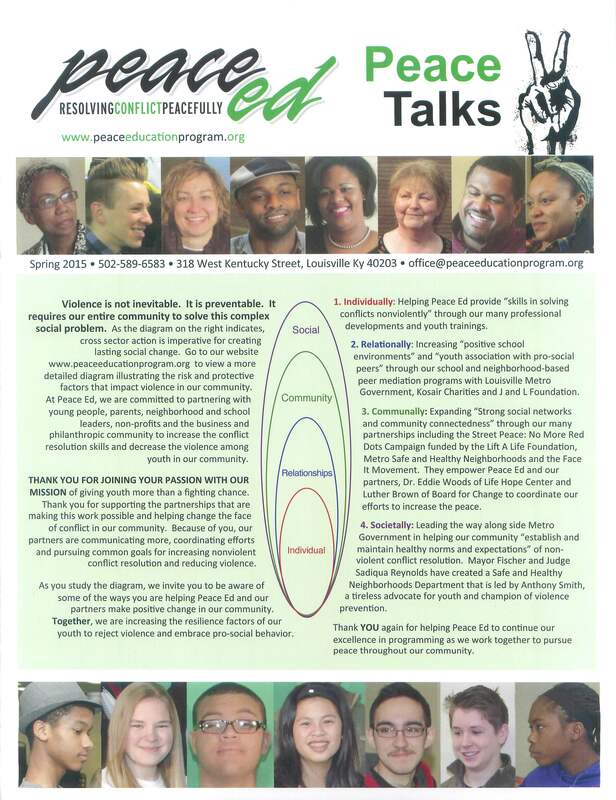 The purpose of the conference was to invite nonviolence as a way of life, to and with those most affected by gun violence, and to mobilize citizens of the community to action. The provided the information about the scale and scope of gun violence so individuals and organizations can better identify actions steps that any and all of us can take for the future. They connect networks to improve relationships, resolve, and readiness to ACT. Focused on the state of Kentucky, and specifically Louisville, I learned how a community is facing increasing violence in their communities by a coming together wi th one voice to make a difference. The city violent crime rate for Louisville Metro in 2012 was higher than the national violent crime rate average by 54.77% and the city property crime rate in Louisville Metro was higher than the national property crime rate average by 51.35%. (cityrating.com) Numerous speakers focused on the “Goliaths” in Louisville that leads to an increase in violence: racism, poverty, crime (drugs & gangs), and education (or lack thereof). What spurred this gathering at this place in time? In addition to the continuing violence in their city and in the nation, the National Rifle Association (NRA) will be having its annual convention in Louisville in May 2106. The Sowers of Justice network hope to change the underlying conversation from “gun rights” and “gun control” to nonviolence, compassion, and peace. Participating in regular peace walks or art actions to end gun violence or similar actions during the NRA convention. Participating in prayer vigils when a gun violence of other incident is being mourned. Actively supporting and lobbying state legislators and local officials to pass and enforce common sense gun laws and measures designed to recede intimate partner violence, homicide, suicide, and gun crimes. Organizing a study and discussion group using one of the books represented at this conference (which include Reclaiming the Gospel of Peace: Challenging the Epidemic of Gun Violence) with your own faith community or organization. Connecting to not-for-profit groups tabling at the event and bringing noteworthy events, activities, and ways to be involved back to the sowers’ network. 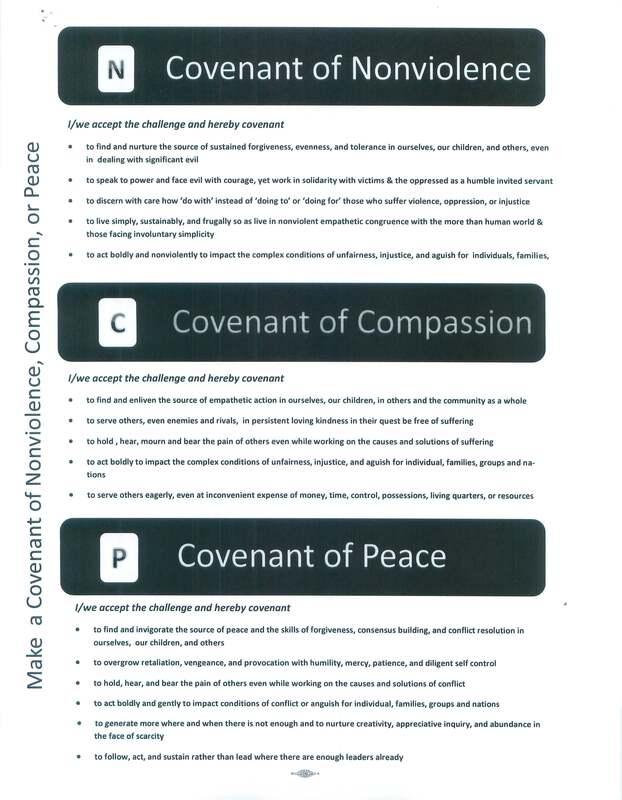 Engaging my faith community and/or family in one of the suggested covenants: Nonviolence, Compassion, Peace (see below for downloading). Connecting with a spiritual practice group and/or a social connection group like the Nonviolence Compassion and Peace (NCP) happy hour. Educate and advocate with others about the realities of systematic racism in our society that will not go away without our action. Resources and speakers were abundant at this event. 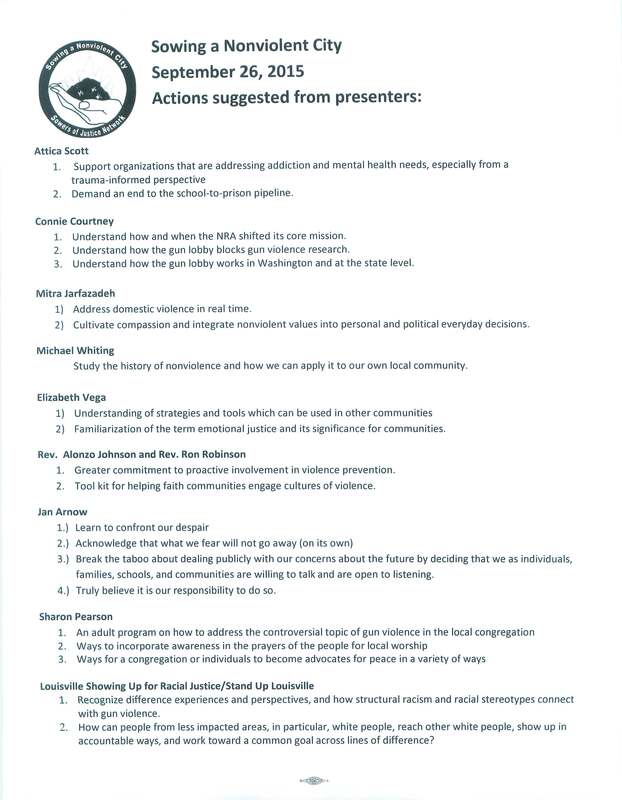 Workshops focused on such topics as community safety, survivor stories, gun legislation, root causes of gun violence, using art for healing, and building relationships across social & economic boundaries. Speakers included clergy and laity from the Episcopal, Presbyterian, Unitarian, and Baptist tradition, the Louisville Police Chief, Moms Demand Action, and Million Mom March. There is much to do. And we can’t do it alone. What if every community replicated such an event to actively promote peace and sow seeds of justice?